Conveniently located a short 3-block walk from Penn Station, in the heart of New York Citys Fashion District, this inviting Times Square hotel provides a contemporary retreat. Our Bistro can offer you breakfast, dinner and drink options every day of the week. You'll also enjoy inviting, flexible spaces where you can work or relax, free Wi-Fi throughout our accommodations, and easy access to the latest news, weather and airport conditions via our GoBoard technology. Plus, our well-equipped and very spacious Midtown Manhattan, NYC, hotel fitness center will keep you fit and energized. Whether traveling for business or pleasure, your stay at our hotel in Times Square Midtown Manhattan, NYC, is sure to be more comfortable, more productive and more enjoyable than ever before. 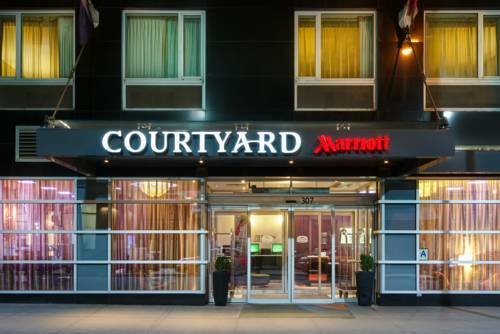 This NYC Midtown Manhattan hotel is ideal for your trip whether on business or leisure within walking distance of Times Square, Empire State Building, Madison Square Garden,Jacob Javits Center, Fifth Avenue, and Broadway Theater District.